“`Mark Hamill tweeted that today the whole galaxy is Irish as he appeared as international guest of honor at Dublin’s St. Patrick’s Day parade. Game of Thrones actor Liam Cunningham was the Grand Marshal at Saturday’s parade, attended by Irish President Michael D. Higgins. 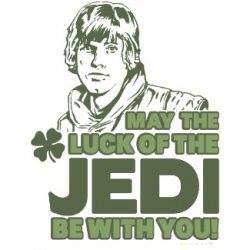 “`The Star Wars actor, whose great-grandmother was born in Ireland, was invited to represent the Irish at the parade. Mark spent time on Ireland’s rocky Skellig Michael island filming the most recent Star Wars: The Last Jedi. “`Hamill sported a tweed cap, a green scarf and a shamrock sprig as he attended the parade, which sees floats, colorfully clad performers, and marching bands wind their way through the Irish capital. Irish Prime Minister Leo Varadkar is at New York’s St. Patrick’s Day parade. “`Hamill has been busy, having just received a Star on Hollywood Walk of Fame. This entry was posted on Saturday, March 17th, 2018 at 1:53 pm	and is filed under Blog by Manny Pacheco. You can follow any comments to this post through the RSS 2.0 feed. You can leave a response, or trackback from your own site.